Who wrote the blistering critique of Donald Trump in the New York Times? It's a question on the minds of White House aides and the media after the New York Times published a blistering critique of President Donald Trump, penned by an author identified only as an unnamed senior Trump administration official. In the op-ed, the anonymous insider claimed that, along with several others, to have "vowed to thwart parts of [the president's] agenda and his worst inclinations." Jim Messina, former deputy chief of staff to President Obama, told ABC News' "Start Here" podcast it would've been up to him to out the anonymous insider: "I am sure that whoever is the poor fool who had my old job is getting reamed right now by the president of the United States and being told to figure out who the hell this guy is." In the Obama White House, Messina, who was in charge of operations, said staffers would've combed through phone logs and e-mail searches in an attempt to solve the mystery, but it wouldn't have been easy, especially if the writer wasn't working inside the White House. "The truth is, you're not going to figure it out unless someone was really sloppy or really dumb," he said on "Start Here." "I can just tell you that when I was deputy chief of staff, Rahm Emanuel would have walked into my office with a bat, and either he would have walked out, or I would have walked out, but I would have figured out what to do about this, I promise you." (Andrew Harrer-Pool/Getty Images, FILE) President Donald Trump (C), national security advisor H.R. 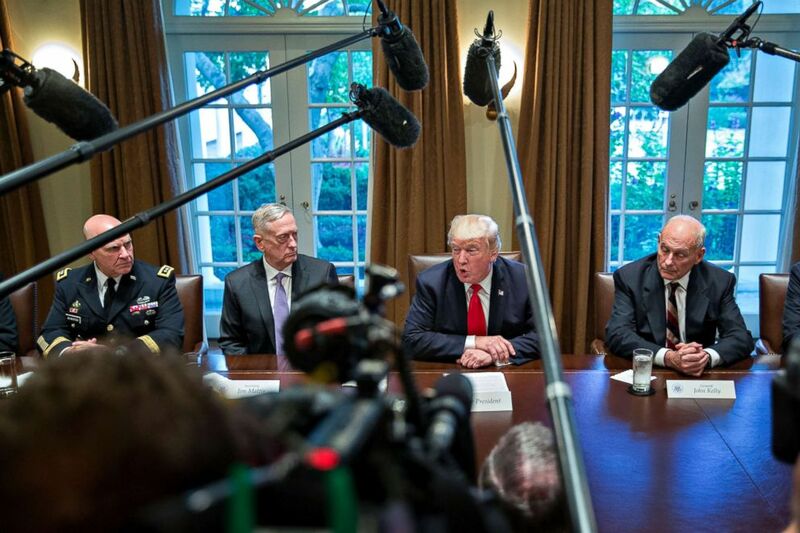 McMaster (L), White House chief of staff John Kelly (2nd L) and Defense Secretary Jim Mattis (R) attend a briefing with senior military leaders in the Cabinet Room of the White House, Oct. 5, 2017, in Washington, D.C. The former deputy chief of staff envisioned a similar scenario happening with White House Chief of Staff John Kelly: "I promise you that John Kelly walked into someone's office and said, 'We've got to figure out who the hell this is, and I want a list on my desk by the end of the day.'" Based on his experience and what he read in the essay, Messina said he thinks the writer is "clearly someone in the foreign-policy apparatus." The White House is calling for the person who wrote the op-ed to step down. White House press secretary Sarah Sanders said in a statement on Wednesday: "The individual behind this piece has chosen to deceive, rather than support, the duly elected President of the United States. He is not putting country first, but putting himself and his ego ahead of the will of the American people. This coward should do the right thing and resign." Listen to the full interview on Thursday's edition of the ABC News "Start Here" podcast.